If you choose to use dread wax, here are 4 quick tips for avoiding some commonly-cited pitfalls. 1) Use it sparingly! Apply just enough to hold your knots in place; you should barely feel it after palm rolling. It’s not necessary to reapply every day, or even after every wash.
2) Never apply wax to wet hair; it will seal in moisture, contributing to musty smells. Wait until your hair is 100% dry, all the way through, before application. 3) Wax is meant to hold knots together; you cannot apply wax to loose hair and expect dreads! Backcomb or otherwise knot up your hair first, then apply just as much wax as you need to keep those knots in place. 4) Check your label, then Google the ingredients. There are a lot of products out there labelled ‘dread wax’, containing chemicals like mineral oil, microcrystalline wax, petrolatum (essentially Vaseline) and various other questionable ingredients. Tough to wash out and potentially toxic. Yuck! These are the ingredients that can stay lodged in locks, rather than washing away over time like natural ingredients do. As is true when researching nearly anything online, it’s hard to get all the information. When someone offers their experience, delve deeper! What worked? What didn’t? What techniques, what aftercare, what products? The more knowledge you can gather, the better prepared you are to make your decisions – and the greater your dreadlocks will be in the end. I’ve used wax successfully for 2 sets of locks. I just found about KNotty Boy products and bought thshampoo bar. OMG!!! This is the BEST shampoo I’ve ever used and I’ve been loc’d for 9 years. No other shampoo will ever touch my hair. i have been using knotty boy wax in a jar which blends GREAT w/ my red hair, and keeps my root tidy an also the shampoo bar for my locks since ive had them for (on and off; i had to cut e once *frown!) 13 YEARS! since moving all over the country a a train hopper/hobo i always carried some knotty boy stuff with me! Then i moved to LA and for the LONGEST i couldnt find any knotty boy and had to use stuff that was sticky and 2nd rate… yuck. NOW i know where to purchase my knotty boy! Thanks for always bein there! THIS STUFF ROCKS EVERYONE!!! I’ve had dreads for about 6 years now and I’ve also done dreads for a few friends. I like the wax but have just started using the gel and I love it! I have fine hair and the gel seems to work better for me. But I always suggest to people to use the wax because it is so reliable! How much I wish knotty boy was sold in stores!!!! However, I still love the fact that you can get good deals!!! Where can I get your product in Kenya? Hi just started my dreads. On week 3 now. My question is, i use knotty boy wax but is it stopping my locks dry out? They feel waxy which im not keen on. Is there another product which can keep them tidyish but wont feel waxy? 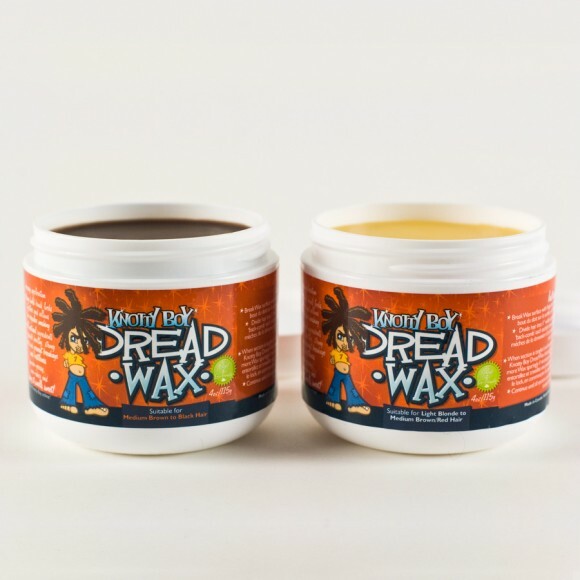 If you use Dread Wax, be sure to not wet freshly waxed dreadlocks, and to not wax wet (or damp) dreadlocks. Learn more here. If your dreads are feeling waxy, use less – it’s powerful stuff! Try our Locksteady Tropical Tightening Gel – it’s a light, wash-out formula. Where can we purchase the wax in western Australia..
My client just got dreads n was told to use hair spray!!! Can i make locks with regular hair wax? Not sure what you mean by regular, we’d recommend our own naturally 🙂 It’s proven to work well on thousands of great looking heads of dreadlocks.